Battleship grey to battle the elements! Wheyward souls! Start packing! Quit your job, cancel the utilities, and tell your roommates your moving out! You’re going on an adventure into the great outdoors. You are now an official rubber tramp. The road is your home in this 1985 Ford F-250 diesel 4x4, custom expedition camper! But wait, there is a catch, it isn’t free. Mom and dad might have to give you an early inheritance. Chateau of 15 square feet. This isn’t any diesel. It’s an ancient diesel. The ancestor of the modern electronically controlled oil burners. It the automotive equivalent to dragging your knuckles and clubbing a mate for marriage. 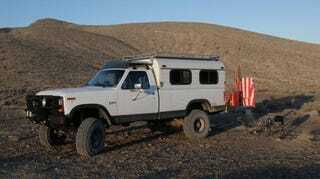 This is the mechanical IDI 7.3l... Direct injection? Nope. Glow plugs and a swirl chamber. Originally this truck was the smaller 6.9l and naturally aspirated. Instead you get the bigger engine and a Banks turbo. We’ve got places to get to quick (a relative term...). Comically slow without a turbo. Not that much faster with a turbo compared to your 400hp 900tq monsters today. Ford came to the market early on in the diesel wars in 1983 with their 6.9L IDI with help from International Harvester. Indestructible, slow, stinky, and simple to fix. Exactly what you want to cross the deserts, creeks, and valleys of this great nation. Of course the spotted owls (or Lorax?) will not appreciate the lack of emissions devices! The white air hose is extra. Stove is thrown in free of charge. What I cannot fathom is why live out of such a small space? Don’t we all want the Revcon Trailblazer or the EarthRoamer?! Why a standard cab and ~15 square feet of camper? None of that should matter. You shouldn’t be inside the truck, get outside and explore! No one goes camping to live in the trailer. You go camping to poop in a hole, get mosquito bites, eat freeze dried food, and sleep on something more at home in a yoga studio. Seats need to be cleaned. But if you absolutely HAVE to be inside it’s going to be cramped for you and your one buddy, friend, or significant other. Two seats is all we can legally get into this one. Sure you could stuff a bunch of people in the back not unlike in Dumb and Dumber... MOCK! Si! ING! Si! BIRD! Si!!! Can’t anyone figure out a better place for gauges? Dash tumors! I couldn’t do it... I want a comfortable bed and a good bog in my RV. I’m tired of my legs falling asleep while I diarrhea into a dirt hole. If I’m close to home; I’d rather drive back at night to sleep in my bed. $33,000 with 229,000k miles (60k on engine). Glamping. That’s what I want to do. I bet I could go glamping much cheaper.